The digital glue service IFTTT is finally launching an iPhone app and it brings with it a set of new channels specific to Apple’s platform and a lovely mobile platform for both building and using its automated actions. The app is rolling out now to users around the world and it’s a well designed and thoughtful implementation of the Web service that will act as an envoy to new users. IFTTT, if you’re unfamiliar, is a utility that you can use to hook multiple web services together to perform automated actions for you. Want a text message every time you get an email from a friend? Care to have your photos automatically shipped off to SkyDrive or Dropbox or Flickr as they’re shot? There’s a ton more stuff that you can do with the hundreds of channels that support popular apps, services and actions. 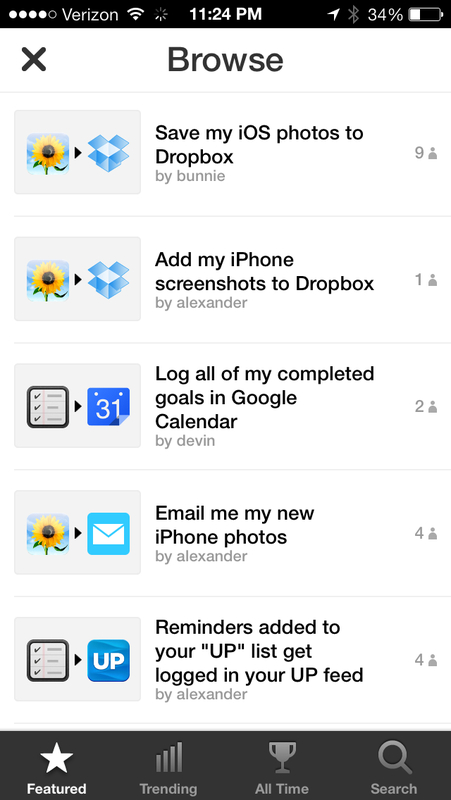 And now the iPhone app brings almost every single feature of IFTTT to your pocket. The only missing note, for the time being, is the ability to take a crafted channel and share it publicly for others to use. 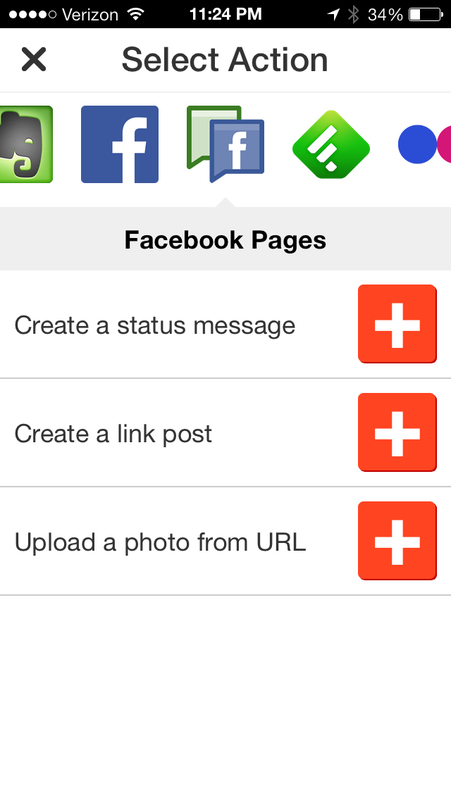 But, says IFTTT CEO Linden Tibbets, that’s on its way in a future version. 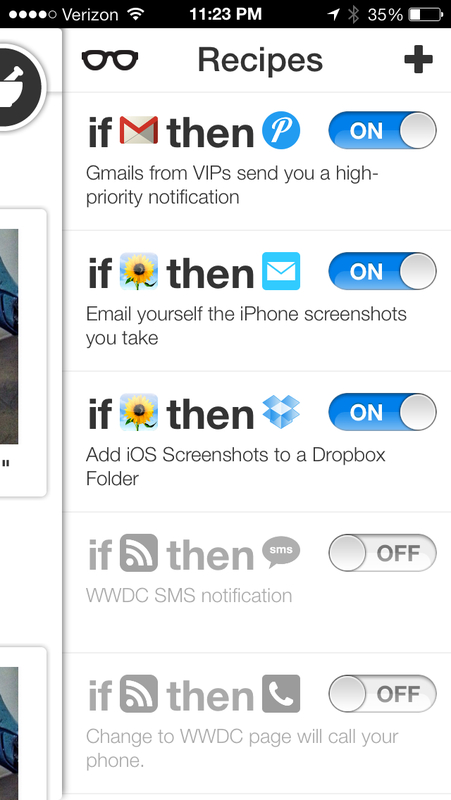 But all of the things that we liked so much about IFTTT on the web are here in the iPhone version. Basically, you pick a channel, which is a simple conduit to a data feed or API from an app or service like Evernote or Pocket. That channel is then combined with a trigger to create an automated action. IFTTT is best thought of as a tool that allows users to tap into all of the data silos in their life and to mix them together to create potent actions. 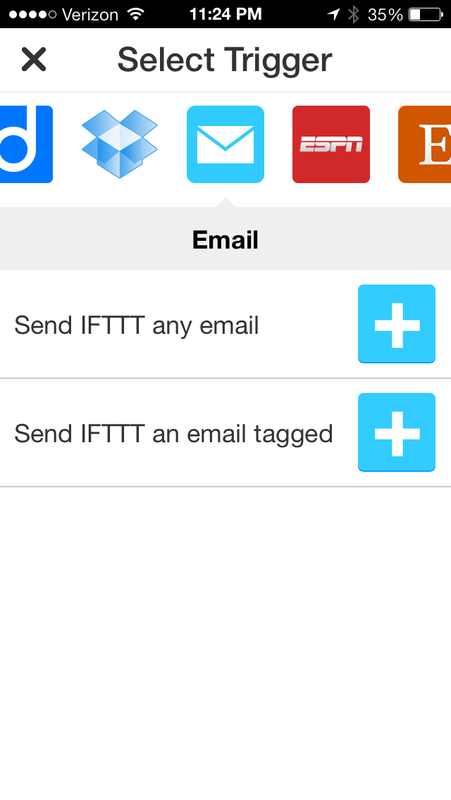 The end result is that IFTTT is one of the most friendly ‘programming’ interfaces every made. And that interface has been polished and optimized to remove as many extraneous steps as possible. This is especially important on a mobile platform, where attention periods can be measured in seconds, rather than minutes. 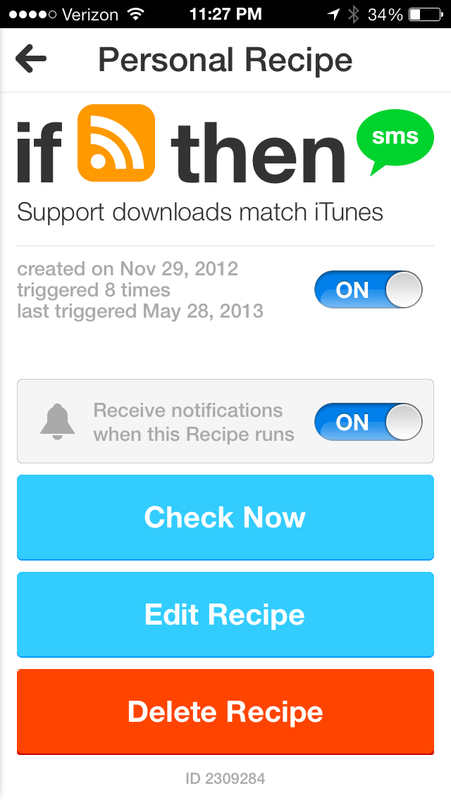 But the iPhone version isn’t just a ‘very good’ adaptation of IFTTT on the Web. 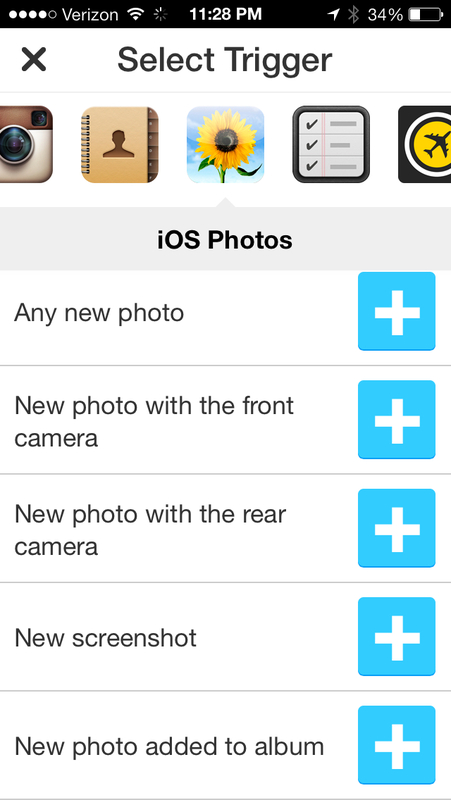 It also offers special channels that allow you to tap into apps like Photos, Contacts and Reminders. Just those three for now, but the potential is already fantastic. That feed is pretty great, as it exposes information to you that isn’t even available on the IFTTT site in such a coherent fashion. It gives you a simple timeline of actions that IFTTT for iPhone takes on your behalf and all of the triggers that are firing off. It serves a dual purpose, both allowing you to see what value the service is adding for you and adding context to what the thing in your pocket is doing without you. It also gives you a hand-picked new recipe to try out each day. It’s broken down by day, and catalogs both immediate actions and time-based events that may run in the background. The background is handled much in the way that Dropbox does photo uploading; by registering ‘significant’ changes in location and triggering the actions that way. This should be light on battery, at least until iOS 7 arrives with its fresh new backgrounding APIs. Some of the actions based on those channels are super clever. There’s one that I’m now using, for instance, that allows IFTTT to watch the camera roll and automatically grab any screenshots that you take and drop them into a Dropbox folder. This is incredibly handy for reviewing apps and, as Foley notes, for developing apps as well. Other cool tricks include recognizing whether the phone is using the front or back camera to take a picture. 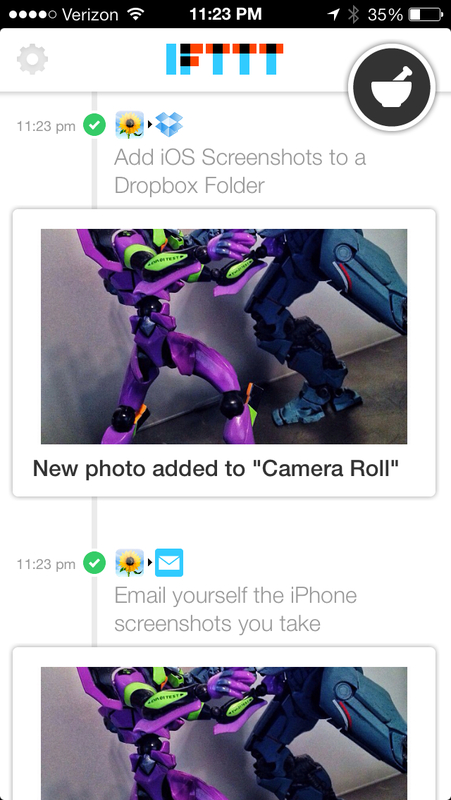 This means that you can, for instance, drop any selfies into a special folder or send every one to a friend via email. The Contacts channel allows you to do things like automatically emailing new entries with a ‘nice to meet you’ message or collating everyone you meet at a conference to an Evernote list. Reminders is similarly appointed, letting you email or send notifications to others when you complete tasks or when tasks are added and more. Push notifications are mercifully handled on a per-recipe basis and they’re all opt-in. These notifications can be really handy though if the end result of a recipe is a post on a social network or another public-facing forum. This way you know for sure something went out when it was supposed to, and you know when something goes out you didn’t want to for instance. Next up is a browser, which lets you see all of the actions and triggers either curated by IFTTT or contributed by other users. Currently, that’s mostly curated, along with trending and all-time most popular recipes. In the future, this section will get more intelligent, reacting to the kinds of recipes you like or the channels you have available. And these new channels won’t stop at the native apps on the iPhone. The app will come to Android, and it will have platform specific channels there too. 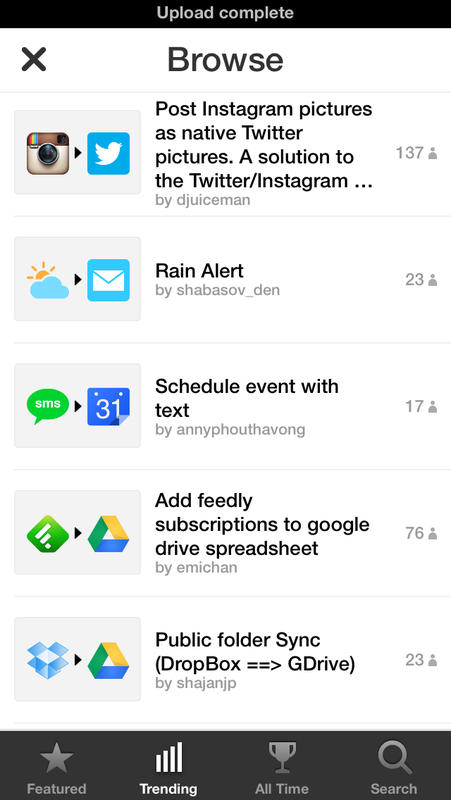 For now, a mobile Web edition of IFTTT offers much of the site’s functions to devices other than iPhone. Android, ironically, is one area where IFTTT actually has some competition in the Italian startup Atooma. In addition, IFTTT is planning a platform for other services and apps to tap into. They’ll be able to generate even more flexible and powerful channels that can be used both on desktop and mobile. With a developer-facing API and a framework that gives them more latitude, app makers will be able to offer IFTTT users far more options for using their apps with the actions and triggers on the service. There’s no ETA on the platform yet, but it’s coming. But the here and now of the app is all about speed and trim. The process of creating the traditional ‘if this, then that’ recipe has been sped up and refined so that it’s extremely mobile-friendly. Any steps that can be removed have been, so that you might feel comfortable creating a recipe while waiting in line at the bank. You should be able to check on activity quickly, of course, but the process of actually ‘programming’ a new recipe should be just as simple. And that’s essentially what people are doing when they’re using IFTTT. Whether they realize it or not, they’re programming. While there are many opportunities for IFTTT to act as a ‘glue’ for services at a very low level, it’s this consumer-facing ability to convert regular people into programmers that is the most impressive. “Creating a recipe, it is a creative process, and when somebody’s inspired to create a new recipe, it could happen anywhere, and we want to make sure that we give them an app that allows them to capture that inspiration,” says Foley. To that end, there will be a bigger focus on recipe creators, with profiles that will allow them to see exactly how many people are using the ‘apps’ that they create. This will keep them aware that they’re one of IFTTT’s ‘top chefs’ and keep them coming back. As you use the app and get a feel for the way it was made, you get the sense that this really is what Tibbets calls ‘IFTTT 2.0’. The app is really the next version of the service, period. Not just an extension of something that will always exist primarily on the Web. And it’s purpose-built with that mobile-centric design in mind. The first version of the app goes a long way towards that promise. As phones get more generous with their battery and devices like wearable computers get more talkative with our smartphones, the opportunities are only going to get bigger. 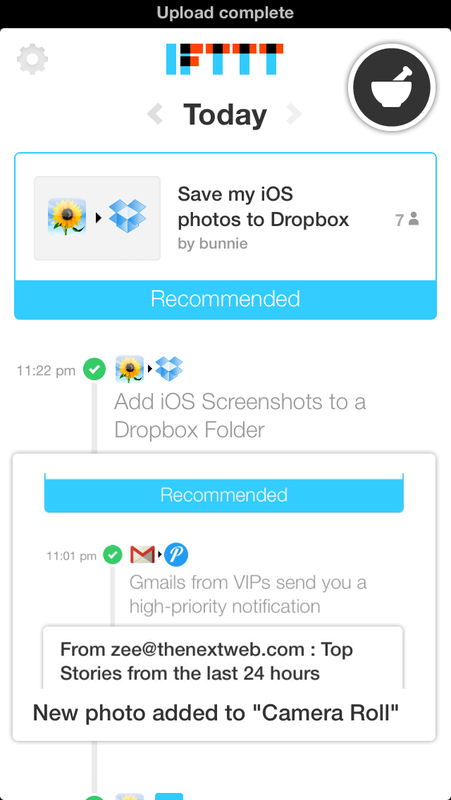 For now, the current app should have a lot for regular IFTTT users and newbies alike to love. Note: IFTTT sent me socks a while ago after I inquired about them. They are comfy.